Yes, Q and Miss P’s got a new 7” out. 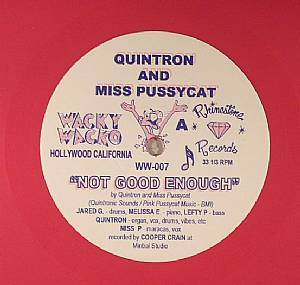 Seems to be a co-release between Wacky Wacko and their own Rhinestone label. Sleeveless but comes in pink (panther) vinyl. A-side’s the original and I must admit that it didn’t grab me at first. It’s kinda slow and andt I thought it wasn’t much of a hit and that’s the kind of thing you want on a 7” from Quintron. But with repeated listens it soon dawned on me how catchy the chorus really is and after a while you start to groove with the slow tempo. It’s the kind of song where you want a video with one cool girl who walks through the neighbourhood and more and more people join her until they’re a cool gang. In slow motion. Know what I mean? It’s that great. The flippety-flop is a jazzy organexquisite take on the Pink Panther theme. Tada-da-da-da-da etc. I’ve been to two parties (one in New Orleans and one in Stockholm) where the crowd grooved to this already so you know you need it if you wanna be hip. Brah!